Can you have weight loss with green tea? Absolutely yes, if you use a green tea extract. There's no question that green tea helps you to increase your metabolism and promotes fat burning. You have to drink a lot of tea, however, to get these affects. Instead of drinking five cups of green tea daily, you could take a green tea extract before meals! Here are the benefits you will experience when you consume concentrated amounts of the plant compounds in green tea. AdipoStat Proprietary Blend [Sphaeranthus indicus extract (flower heads) and Garcinia mangostana extract (fruit rind)] 400 mg Other ingredients: vegetable cellulose (capsule), microcrystalline cellulose, silica, vegetable stearate. Dosage and Use - Take one capsule twice daily 30 minutes before meals, or as recommended by a healthcare practitioner. I like this company a lot because it has high quality control standards. There is a 100% guarantee with this product. If you do not get results within 90 days you can contact me for a complete refund. Call toll free 855-485-5373. Mega Green Tea Extract is the green tea extract I recommend for getting all the benefits of weight loss with green tea. The compounds in green tea that positively impact weight management are it's antioxidants which also support your natural immunity. So you are building your health and increasing your metabolism when consuming green tea extract. This is because there are green tea polyphenols called catechins that help you reduce body fat. It's most powerful antioxidant or catechin is EGCG. It promotes thermogenesis which is a fat burning mechanism. It also inhibits fat digestion and absorption. These polyphenols make up 30-40% of green tea and only 3-10% of black tea. Green tea catchins also play a role in reducing inflammation and restoring cells to health. Inflammation is often present in people who are storing excess fat especially if they are obese. Reducing inflammation is an aspect of restoring the metabolic capacity of your cells so that you can metabolize glucose and other nutrients properly. Losing fat permanently is all about addressing the serious imbalances you have acquired by too many unhealthy diets and carrying too much weight for too long. Green tea helps you to burn fat and it also will help to suppress your appetite. To have these benefits it is better to take the extract. 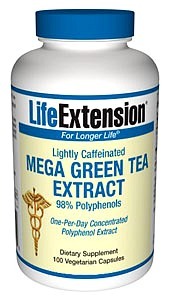 You would have to drink at least five cups of tea to equal what you get in one serving of the Mega Green Tea Extract! It acts as a green tea appetite suppressant and supports thermogenesis. Green tea extract needs to be a part of a comprehensive program for you to increase insulin sensitivity and restore the metabolic capacity of your cells. You need to have a low glycemic eating plan and you will have weight loss with a green tea extract. All of the wonderful health benefits of green tea will be your's in a far more efficient way with Mega Green Tea Extract. Return from Weight Loss With Green Tea to Definition of Obesity. Return from Weight Loss With Green Tea to Lifetime Fat Loss home page.